The Arms Reach Concepts Inc. Co-Sleeper Mini Clear-Vue come with two layers, the top rung is for the baby and the bottom rung is for storing the baby products or toys. There are four wheels in the bassinet so it can be easily moved around the house without any major hiccups. The assembling of this product is very easy and it is quiet easy to dismantle too. Since the size is small, it is apt for small sized bedrooms. An important highlight of the Arms Reach Concepts Inc. Co-Sleeper Mini Clear-Vue is that there is a 360 degree safety mesh over the sleeping area. This not only gives improved air circulation to the baby, but also provides support to the baby, when it rolls over in sleep. This product is recommended to be used until the baby is 5 months old. Beyond this age, the baby starts moving its hands and knees vigorously; hence there is a danger of falling off the bassinet. This gives the parents a clear view of the baby and hence they can rush to the baby’s need whenever the baby feels uncomfortable. This comes with cotton mattresses and sheets that are very soft and gives a warm feeling to the baby when sleeping. The baby feels absolutely comfortable here that it does not wake up often during the night. This bassinet also comes with a packing case where this can be stored compactly, while travelling. Babies feel very uncomfortable in the hotel beds and hence travelling can become a nightmare for everyone due to lack of sleep. This bassinet is a solution to all these problems. The full mesh cover protects the baby while rolling over unknowingly in sleep. It also improves air circulation within the bassinet, so that the baby does not feel suffocated. This is very compact and can be easily fitted even in small rooms. 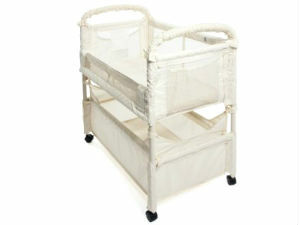 One can use this bassinet by itself without attaching to the main bed. Assembling and removing this bassinet is very easy. The strong frame gives immense support to the baby. The parents can have a clear and continuous view of the baby sleeping or playing in the Arms Reach Concepts Inc. Co-Sleeper Mini Clear-Vue. The texture of the material used as mattress is 100% cotton and hence is very safe for the babies. A huge storage area that accompanies this bassinet is a big bonus for parents. All the stuff necessary for the baby like diapers, lotion, medicines, toys etc. can be stored here. Hence one does not need to run around to the nursery every time to fetch these products.